A rippled leaf vegetable with a white or red stalk and green leaves that have white veins running throughout the stalk. Chard grows in clumps as either a white or red variety. 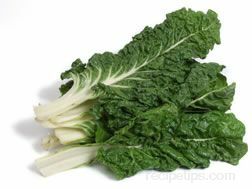 The common red chards include rhubarb or ruby chard while the common white chard is also known as green chard. Typically, this vegetable green is sold in loose leaf bunches rather than clumps. The leaf and stalk can be eaten raw or the leaves can be prepared in same manner as spinach and the stalks can be prepared like asparagus. 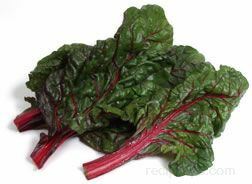 Chard is a member of the beet family, however, it is a plant that grows upward rather than downward like the garden beet that is considered a root vegetable. Chard is available throughout the year but its peak season is during the summer. When selecting, choose fresh, tender greens and crisp stalks, avoiding those that are wilted or have blemished leaves. To store, wrap in a plastic bag and keep in the refrigerator for up to 3 days. 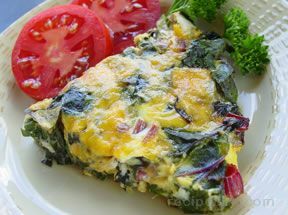 Chard is also known as Swiss chard, spinach beet, leaf beet, seakale beet, silver beet, and white beet.